They visited the experimental fields, familiarized with the history of creation and existence of the station, with prominent scientists and breeders who worked and visited the station. 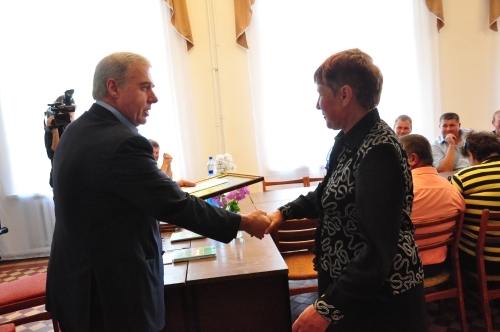 Grygorii Kaletnik met with the personal staff of the station and awarded them the diploma of the Verkhovna Rada of Ukraine for serving the Ukrainian people and the best workers were honoured with letters of the Verkhovna Rada Committee on Agrarian Policy and Land Relations and cash prizes for hard and productive work, as well as professional mastering. In the words of a great breeder, who spent most of his life working at the station, L.L. Sempolovskyi: "For a successful and productive work we need deep knowledge of the subject, experience, observation, love to work, commitment and desire to achieve the goals." All these qualities are, without exaggeration, typical for the workers of this station. 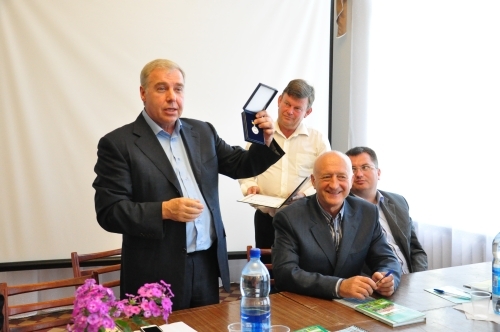 The workers shared with their achievements, best elaborations and said that at the given moment they are working under energy crops (energy willow, sugar sorghum and sugar beets), which can be used as a raw material for the production of different types of biofuels, which is extremely important for Ukrainian environment, energy and food security.